If you don't think this is the cutest thing ever, there is seriously something wrong with you. On Thursday when I went to pick up Isaac from my Mom's, she greeted me at the door with a whisper and directed me to the dining room table. 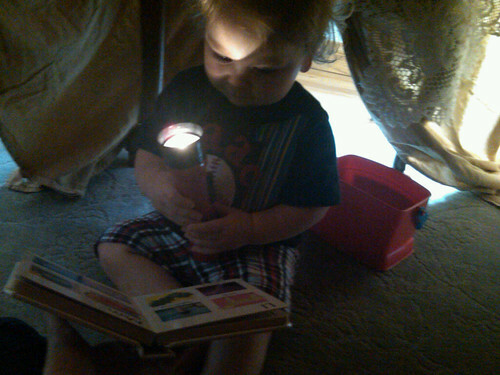 Isaac was sitting in his fort [a sheet over the dining room table], reading his book with a flashlight. Oh my...that is absolutley adorable! Oh my gosh, I LOVE it. Adorable!! HAHA That just made my morning! Ahhaha that is great! Look at him reading too! OMG that is so adorable!! What a ham! Squee! That is sooo cute! He's getting to big such a big boy! he is so freaking cute I can't even handle it. so so cute, I could not stop the awwws from escaping my mouth! Definitely brought a smile to my face! this is such a quintessential 'childhood' snapshot! Love it! I love it! What a sweetie!